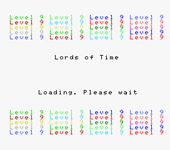 Lords of Time is an interactive fiction computer game designed by Sue Gazzard and released by Level 9 Computing in 1983. Originally purely a textual adventure for 8 bit microcomputers, the game was later released as part of the Time & Magik compilation where graphics were added for the Atari ST and Amiga versions. Like all Level 9 adventures of its time it was written in the in-house A-code language which was platform-independent - this implementation of a virtual machine allowed for quick porting across platforms. The anonymous hero of the game (controlled by the player) appears to be a computer programmer in contemporary times. At the start of the game the hero is contacted by Father Time who sends the hero on a quest to recover nine treasures in order to defeat the machinations of the evil Time Lords. The game is divided into 9 eras of time (not including the starting section in the hero's living room), such as the twentieth century, ice age, age of dinosaurs, dark ages, future, the middle ages, Tudor England and the Roman Empire. Due to the meddling of the Time Lords anachronisms abound, for example cavemen are found living in the same era as dinosaurs. Access to the nine different eras is via a grandfather clock that turns out to be a time machine in disguise. Source: Wikipedia, Lords of Time , available under the CC-BY-SA License.